You are not purchasing a replacement part. Este es un servicio de reparación, ¡debe enviarnos su módulo para su reparación! No está comprando una pieza de repuesto. How does this repair service work? Package the form and your module for repair. We then inspect and confirm the failure with your module(s) before proceeding with the repair. Different part/board numbers we service. Main board failures our service covers. HDMI don't work but TV turns on fine. No signal appears regardless of what is plugged in. TV turns on, but is stuck at the on screen Vizio logo. Vizio standby light on the frame keeps blinking. What is the turnaround time for repair? What if my symptom is not listed or I have another unlisted issue? We are able to repair most symptoms that are not listed, please message us prior to placing an order. Do you work on boards that have been serviced before or have missing parts? We sure do, but you must message us with details prior to placing an order. What happens if you can't fix my board? What if you receive my board in working condition and it passes your tests? 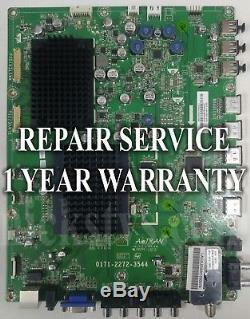 The item "Mail-in Repair Service For Vizio M3D650SV Main Board 1 YEAR WARRANTY" is in sale since Sunday, February 4, 2018. This item is in the category "Consumer Electronics\TV, Video & Home Audio\TV, Video & Audio Parts\TV Boards, Parts & Components". The seller is "nickstvs" and is located in Tucson, Arizona. This item can be shipped worldwide.